Hello, this is Virginia from Yes, Virginia…blog. I am so happy to be back again to share my 3 projects with one large cling stamp. As you may know that I like to use the same stamp for many creative ways. Let’s get to it, shall we? This Rose Terrace Cling Background from The Ton Stamps measures 6″ x 6″. The great thing about a large background stamp is that you can apply all sorts of techniques to create different looks. Let’s get right to the cards and you will know what I mean. For my first card, I took a watercolor approach and applied the entire stamp with Spectrum Aqua Markers. They are one of my favorite supplies this year. The price point is reasonable, the colors choices are awesome and they are pretty tough to withstand my abuse use. I am not a patient person, so it took me about 3 minutes to color the entire image. The key to a successful inking, in my view, is the amount of water. It has to be “just right”. I think 3-4 sprays from a 10-15 cm distance is a good start. I used the coral, pink and yellow for the flowers and used two shades of green fro the stems and petals. I was pleased with the result. 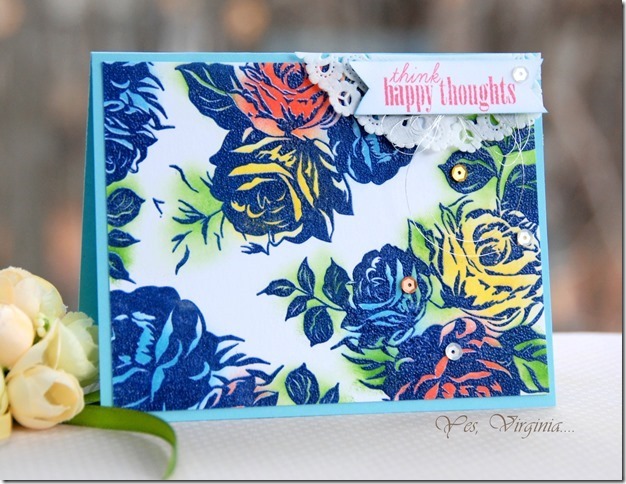 For my 2nd card “think happy thoughts”, I wanted to experiment with darker and richer colors. With the help of MISTI, I stamped the entire image in navy blue and then clear-embossed it completely.You can use any Navy Blue Embossing Powder instead , but I prefer this way since I love the Navy Blue Ink from Hero Arts more. I then went back to add yellow, blue, pink/orange and green to the flowers and leaves. I finished the sentiment with a doily and silver strings underneath. Another great advantage of using a large cling stamp is that you can utilize a small section of the large stamp to your liking. For example, my 3rd project is the easiest one to create since I used a partial section of the stamp. However, it is still colorful and eye-catching! I applied just 5 colors of the Zig Markers and see how bright the colors are!? The most time I spent on this design was creating the scalloped borders ! The actual stamping is so fun and soothing! 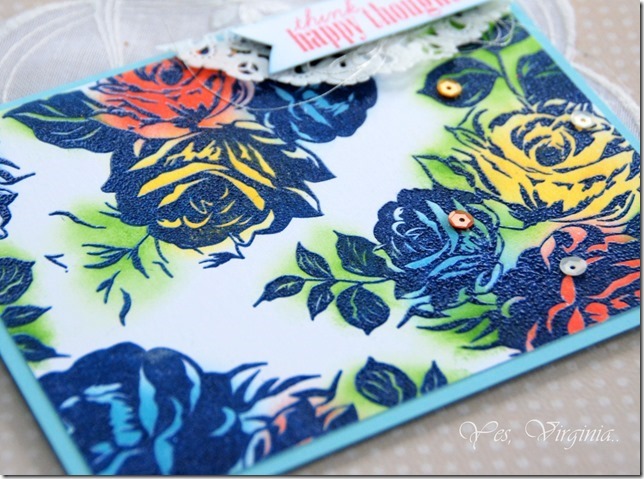 Isn’t this Rose Terrace stamp amazing? Thank you so much for stopping by. Beautiful cards! 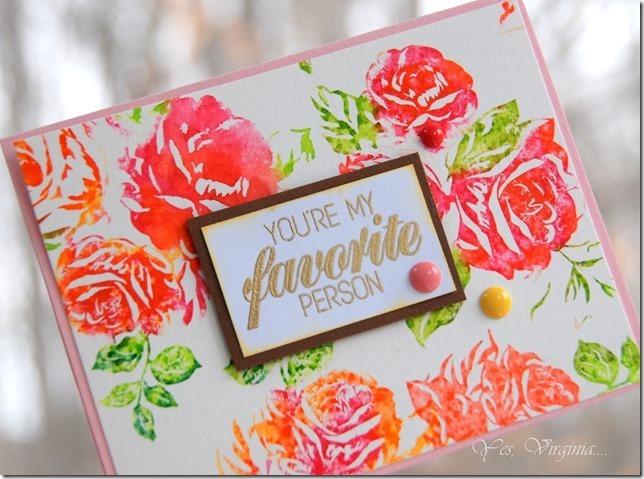 Did you have to use watercolor paper for the You’re my favorite person card? Hi Amy, Yes, indeed I used Canson watercolor paper on my first (you are my favorite person) and 3rd card! Oh Virginia, these cards are simply gorgeous!!! Your cards are gorgeous. What a wonderful use of color! Virginia did such an amazing job with this lovely stamp. Love each on of her cards for different reasons. The first because, to me, it truly looks like watercoloring. The second because it so innovative and clever with those shaded colors juxtaposed against that beautiful navy. And the third because of her skill in inking specific areas. The cards are beautiful. I love the colors you picked. Wonderful, wonderful-Virginia-these cards are so excellent. You have never been wrong in any of your suggestions about products so you can be sure this beautiful stamp has been added my “please, please” list that only I know about. 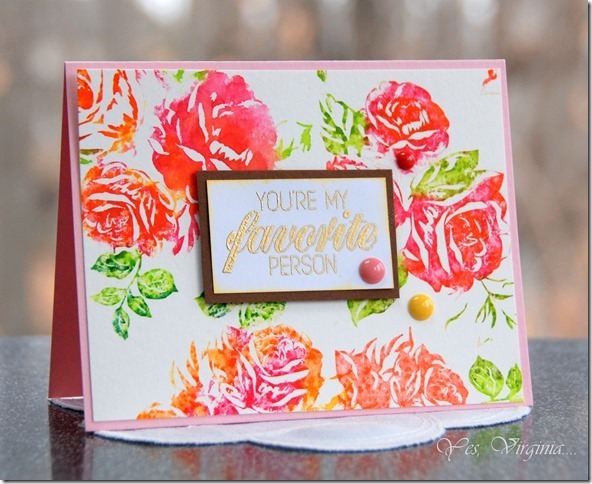 The versatility you show us is so helpful to me as I am really a challenged stamper. Thank you. I love how this stamp lends itself to watercolor features. It makes it so versatile to use distress ink pads or different type of markers like you did and spray with a bit of water. The cards are so different from each other but all so beautiful. You’ve done an amazing job on all three cards. They are absolutely beautiful! The cards a simply sensational! Thank you for inspiring me to create today. 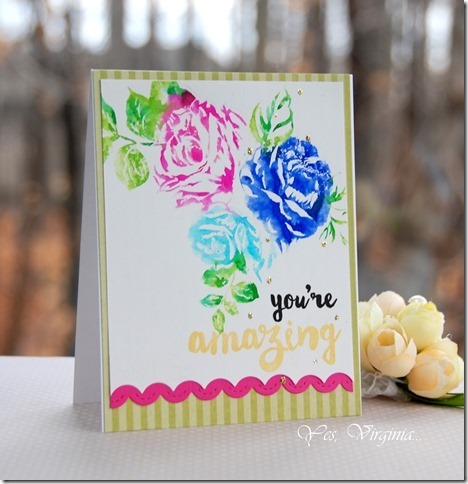 BEAUTIFUL cards Virginia – LOVE your roses, especially the blue, my father dreams of getting a blue rose, one day!! !